Any business that includes transportation or distribution of supplies often suffers from the field management issues. A proper supply and distribution chain essentially aims to ensure fluent and uninterrupted supplies to fulfill the market demands. It is a very important task especially for the Retail Sector which directly deals in consumer based products. If a business is unable to strike a right balance between the market demand and the retail supply, it ought to struggle. Supply and distribution involves a big chunk of field work. And the field management is most stressful and translucent process because your team is mostly away on the field and they are constantly moving around with the supply vans. The consistency and fluency often suffers from the ever existential vulnerabilities of the field issues. Worst part is that any interruption in the supplies naturally hampers the sales which is inevitably, a loss for the business, of the business, and by the business. The hectic schedules are greatly influenced by the invariable uncontrolled and unpredictable factors which are indispensable, to say the least. The fact that your team is always on the move adds more weight to your woes. Let us first figure out the issues that complicate the tasks and then, try to seek appropriate solutions which include supply tracking, automation of work reports and real-time inputs while the team is ‘on the move’. Teamspoor provides an exceptional relief in handling of such complex field operations. The biggest challenge for the management of the field tasks is the fact you are not with the team on the field and still expected maneuver them productively in order to deliver optimum results. Even if you want to be with your team, you still can’t be with all of them at the same time. So if you want an apt solution to sort the field issues, you need to address those conceptual problems which are inseparable part of any field task. ‘Execution’ is a basic problem in the process of distribution and supply. This inadvertent problem is the primarily caused due to obvious management loopholes concerned with ‘field’ tasks. Mostly, the staff members are assigned their respective tasks when the day begins. But as they are always on the move, so it is impossible to maintain the workflow throughout the tasks. The hostile traffic conditions, waste of time and many other circumstances abruptly hold back the planned supply chain. It is rare to find a supply team execute their tasks within the expected time. The Sad part is that most of these factors are not under the control of a manager without any technological assistance. Transparency is the last thing you will associate with the distributors and supply chains. Most of the on-field tasks are out of the radar of a manager. The non-transparency is a major reason which drags efficiency and proper management. A manager under normal condition doesn’t even know the whereabouts of his team members or how many retail stores have they visited. It is only possible for a manager to assess the work once his team returns from the field with the reports. And again, you never know how factual a report is because, at the end of the day, there are many cases of report manipulations. Yes, A Business thrives on factual data. The most business which supplies their products to retailers needs to fabricate a delivery system based on the market demands and supply. But as there is a lack of data input, they often lose their customers due to poor delay in delivery. In many cases, supply chains have incurred a severe loss of business by using speculative data rather than actual figures. 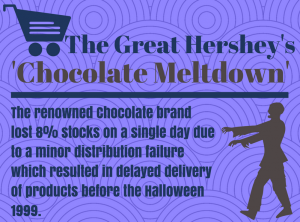 Even a slight displacement of figures could result in a catastrophic loss to a company. For instance, Subhiksha, a retail brand which operated in India ended up drastically due to their poor supply chain management practices. They relied on speculative data and very often they supplied ‘less-popular’ products where they had better number of sales. While on the other hand, they delivered the more profitable products in region which had really poor sales. So, it usually meant that they didn’t supply enough stock where they had more customers. The company incurred a heavy loss and the company closed down after the year 2009. Interestingly, the company enjoyed a sudden rise and the period of fame didn’t last long. Most of the supply chain management system rely on delayed reports which are submitted by their staff at the end of the day. While It does make them accountable but It also offers sufficient convenience to cover up their inefficiency and poor productivity. More importantly, you can’t do anything to change a poor report when you get it at the end of the day. So, whatever you can do is applicable for the next task itself. The only respite is the fact that you can adjust your plans accordingly for better productivity from the next time. It makes you uncomfortable, frustrated and helpless, all at the same time. A business which is good at making use of available resources is the more profitable in the longer run of time. If you manage a supply chain, you need to have that flexibility to adapt to requirements. But unfortunately, conventional means of supply chain management don’t have anything that supports flexibility and adaptability. When you don’t where your team members are at a point of time, it is hard to mobilize your human resources even if it could help your cause. Many times, this flexibility works out in the cases of any urgency or specific requirements. In today’s competitive distribution market, it’s almost a compulsion to use modern technological assets for increasing the work efficiency and garner better productivity. The process of automation has revived many failing retail suppliers. In fact, most of the successful supply chains are leveraging the technologies to their advantage for consistently delivering the products as per the market requirements. This software is very reliable because of their cloud-based data network that ensures continuous connectivity and accessibility. Many small businesses have developed themselves within a short span of time by making the best use of the available resources. And frankly, a successful business is all about making the more money out of less. It is an android app which has been carved keeping in mind the business issues which haunt most of the field operations. It uses GPS tracking system to locate your team members on the map and keeps you updated with their geographical displacement along with their movements. It has advanced productivity calculator which calculates the time which your team has productively spent at stores. The integrated DSR automation system allows you to send supply reports as they take place. The app has been set in accordance with the functions in an order they should occur. So, you can make sure to capture every relevant detail while simultaneously easing the process of events effortlessly. 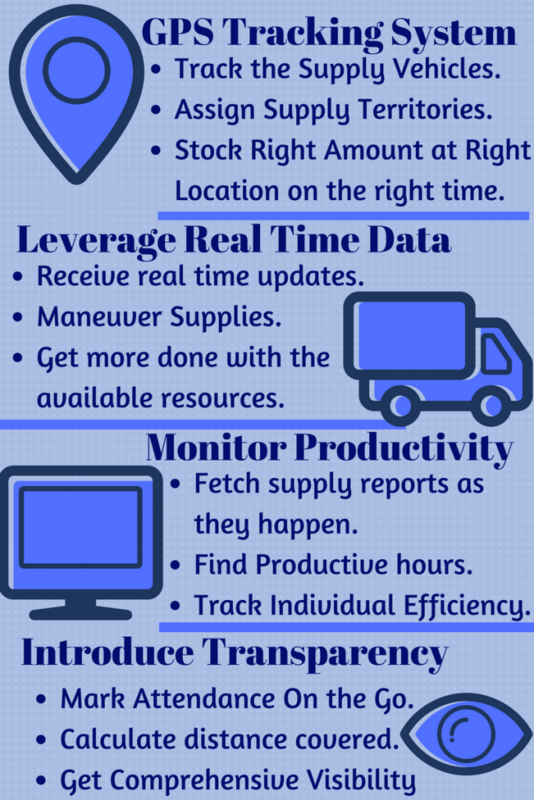 Here is an elaborate and simplified guide for you to use teamspoor for a well-organized supply chain management. First and Foremost, it is very important to create a working structure and divide the responsibilities to your team. Assigning geographical a limited supply areas to each individual on the basis of the workload. It is can backfire if you assign the functional areas on the basis of distance as the only parameter. Many a time, even smaller regions make for a major proportion of the supplies. In such cases, using geographical territories alone can be disastrous, both for your business and the concerning team. The workload is an equally important factor which one should consider while assigning the geographical territories. Equal distribution of supply work releases additional burden from a specific person. It brings individual accountability on every team member for the work-efficiency on his functional territories. It reduces unnecessary waste of time in traveling and the saves fuel. It avoids disputes which are common in-between the team members, mostly due to interference in other’s work. Once you assign the supply territories and specify the tasks in accordance, you can easily access the geographical whereabouts of your team sipping coffee on your office computer. This satellite-based tracking system ensures that your team is in their respective functional area. The satellite-based monitoring systems are a reliable and consistent way to notice the progress of your supply teams in their respective tasks. It enables you to maneuver the human resources productively. The tracker ensures that every team member is working within his territory. It signals out less active members of your team. It is a very dependable way of calculating the distance covered by every member of the team during the supply visits. If your supply staff is on the field and you have an access to their field activities, it enhances the work transparency. As soon as your team accomplishes a task, he will instantly report the same using DSR Automation. One of the most relieving factors is that this app can mark your team’s attendance from wherever they are and notes down the geographical location for clarity. This makes it a really pleasant way of monitoring your team. As a matter of fact, you also get to know the time your supply teams spend at each location while the exchange takes place. Thus, it is a flawless way of monitoring the time which your supply vehicles spend at a location. As soon as the exchange is over you get notified about the progress report which is automated and easy to fill. Gets more done with the same resources. Allows you to manage with a comprehensive visibility. Monitors the field tasks carefully in real-time. The Teamspoor application allows you to send free messages to any team members. This feature along with the integrated tracking system serves the real-time data right on your computer screen as soon as the events take place. The real-time data enables you to guide your team in case it is needed. This transparent monitoring system enables you to effectively strategize your moves to get even better productivity. Your team is always on your radar and you can effectively communicate with the team member whenever you want to. Thus you can guide them for better. Using this data empowers you with a formidable adaptability to cope with odd circumstances by modifying the plans as per the real time data. It essentially gives impeccable flexibility to your supply plans. It is a critical factor for any successful supply management chain which helps it grow over the years with productive performance. Modify your Plans and mobilize your resources when needed. Maneuver the overall productivity effortlessly. With such high level of clarity and transparency, you get a really fantastic way of managing your team with better efficiency and effortlessly build a certain competitive yet friendly work environment. From the distribution of functional territories to assigning equal opportunities, all things add to raise the team spirit and makes for competitive yet healthy team spirit which eventually boosts your overall productivity to unexpected heights. You can not just avoid work interference and unnecessary disputes between your team members but also make sure that you guide your team towards a healthy work environment. Because with all due to respect, field management needs to get smarter if it wants to take the best out of a team. Teamspoor just tries to fill this void which is a much-needed demand of the supply chains today. Previous PostHow TeamSpoor Can Be A Boon Both For On-field Sales Teams And Their Managers?